Start your day by walking across the street to the Parliament (before protesters start gathering in the afternoon) to watch the ceremonial changing of the guard (every hour on the hour), then head through the National Gardens toward the Roman Stadium (aka Panathenaic Stadium), originally built of marble in 329 BC and renovated in 1896 for the first modern Olympic Games. Next, meander past the Temple of Olympian Zeus toward the Plaka, the charming but touristy historic neighborhood beneath the Acropolis. Follow the signs for the Acropolis Museum, a modern and visually entrancing museum opened in 2007 and filled with artifacts from the Parthenon (Note: it is closed on Mondays). The museum’s second-floor restaurant is a great spot to enjoy a light lunch with a glass of wine, as it offers a panoramic view of the Acropolis. If it is really hot outside (as it tends to be in Athens throughout the summer and into the fall), stroll the mostly shaded streets of the Plaka (and stop for a sweet bite of baklava in one of the tavernas) as you wait for late afternoon to make the climb up to the Acropolis. At the ticket gate for the Acropolis, you can hire an English-speaking guide, or just go it alone with a guidebook. There is constant restoration being done on the 2,500-year-old Parthenon, so scaffolding abounds, but a walk around the entire structure is a must and the views from the overlook (shown at right) are amazing. 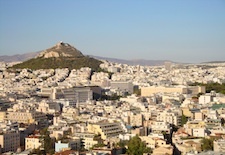 You’ll look down on all of Athens, from Lycabettus Hill to the Ancient Agora and all the way to the Aegean Sea. From the Acropolis, stroll through the Ancient Agora as you head back to the Grande Bretagne in time to enjoy its most winning asset: its rooftop bar and restaurant. Although some of the hotel’s rooms and suites (shown at left) have Acropolis views, the view is best enjoyed over cocktails at the GB Roof Garden bar as the sun sets, followed by an alfresco dinner on the roof terrace as the Parthenon is illuminated. Yes, the protesters below are a noisy bunch, but that just adds to the only-in-Athens experience of ancient wonders-meet-modern-woes. 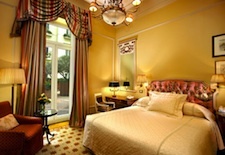 Rooms at the Grande Bretagne start at $380 per night. On the coast: An option for those who want a more relaxing ambience than central Athens offers is to book two nights at a coastal resort – and do a full-day tour of the city. I recently stayed at the Arion Resort & Spa and found it to be an elegant and romantic setting with plenty to offer couples seeking sun and pampering. 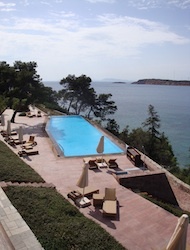 The resort, part of the Astir Palace complex about 40 minutes’ drive from central Athens, features 123 rooms and suites plus 48 bungalows, all set on a picturesque cove and offering both a pool (shown at right) and a beach. There’s also a spa, with an indoor pool and Jacuzzi overlooking the water, where the signature Sugar, Bee’s Wax, Honey Wrap & Greek Orange Deep Hydration Treatment will leave your skin looking great and feeling super soft. The rooms and suites (shown at left) are located in both the main building and in a series of bungalows set along the cove. Dining-wise, Arion offers a superb breakfast buffet and a trio of options for lunch and dinner. The charming beachfront Taverna 37 serves delicious Greek fare (salads, grilled fish, spinach pie) for lunch, while the sophisticated, cliffside Matsuhisa Athens (run by master Japanese chef Nobu Matsuhisa) is a fabulous spot for a splurge on fresh sushi or miso black cod. The Grill Room features Mediterranean cuisine for dinner. As an Arion guest, you can also access the pool and restaurants at The Westin Athens, a short walk away. 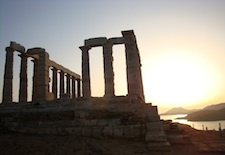 If you stay two nights, you can spend a day in the sun, then book a three-hour excursion to the Temple of Poseidon for sunset. It’s located about 50 minutes away, on a peninsula that is the southernmost point in mainland Greece, and the hotel will arrange a private car and driver for 150 euro for up to four people. The drive is pleasant (you can stop for a drink or an ice-cream snack along the way) and the view at sunset is pretty spectacular (shown at right). And you’ll arrive back at Arion in time for a late dinner. On day two, you can book a transfer to Athens so you can explore on your own, or a full-day tour with a guide (check with the concierge for prices). A stay here lets you sample the city while enjoying the pleasures of the coast. 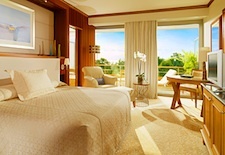 Room rates at Arion Resort & Spa start at $460 per night.